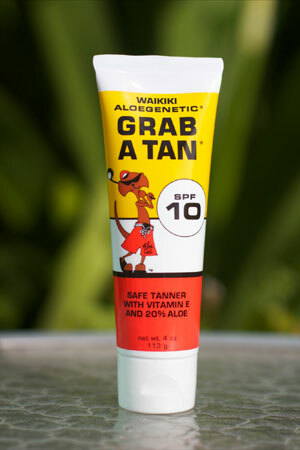 Grab A Tan SPF 10 - 8 oz. Designed for very fair (pink tones) and sun sensitive skin types. Follow the timing suggestions on the Tanning Schedule very closely if you are extremely fair, as excessive perspiration from prolonged sun exposure will become your worst enemy. (Another name for excessive perspiration is “people oil without a sunscreen.”) Switch to Step 2 on the Tanning Schedule only after swimsuit lines are clearly defined. 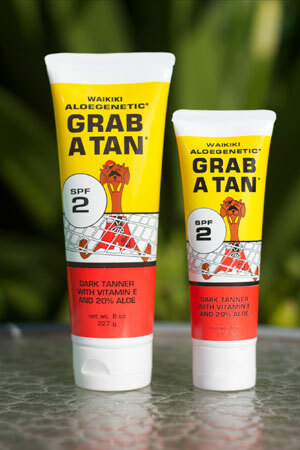 Grab A Tan SPF 8 - 4 oz. Offers adequate protection for those who have moderately fair skin (light to moderate yellow tones). Apply 30 minutes prior to sun exposure, and follow the recommended sun sessions and breaks as outlined in Step1 of the Tanning Schedule for Moderately Fair. Move to Step 2 only after clearly defined swimsuit lines are visible. Grab A Tan SPF 2 - 8 oz. 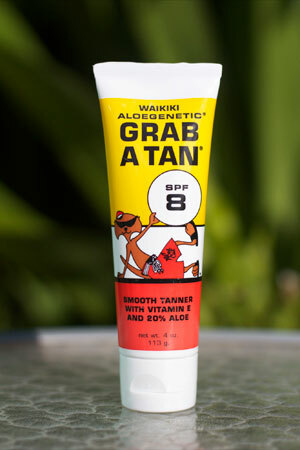 Designed for those who have a very good base tan or who simply have naturally dark skin tones. On the Tanning Schedule, GRAB A TAN SPF2 is Step 3 for Very Fair (Sun Sensitive), Step 2 for Moderately Fair, and Step 1 for Very Dark Tones, (Olive). Carefully observe the suggestions on the Tanning Schedule and shorten the sessions every time you step down to a lower screen, gradually increasing the length of sessions. Never stay more than 2 hours in the sun without at least a short break to rehydrate by drinking water, and letting the temperature of the skin to cool down. This will get you better control, better color, and a healthier tan. Tanning is a natural function of human skin; turning red or even slightly pink is an injury to the skin. Day 4 3-4 sessions 1 hour each * For product details, click on any of the product names on the charts above and below. After 2-4 days on Step 1, you should begin to have clearly defined swimsuit lines. Once you have these visible lines, your skin is sufficiently "conditioned" to move to Step 2 if you desire more color at a faster pace. To move at a slower pace, remain on the product recommended in Step 1, and gradually increase exposure time - never exceeding 2 hour sessions before taking a 30 minute break. Day 4 3-4 sessions 1-1/2 hour each * For product details, click on any of the product names on the charts above and below. After 3-5 days on Step 2, your color will begin to develop further. For many, this step helps to promote as much color as desired. Remaining on the product recommended in Step 2 will continue to develop color at a moderate pace. However, if you wish to deepen the good base that is developed in this step, you may progress to Step 3 once you have built up to 2 hour sessions in Step 2. * For product details, click on any of the product names on the charts above and below. Gradually build your sessions until they are 2 hours in length. Never stay longer than 2 hours in the sun without taking a break to allow your skin temperature to cool down. Drink plenty of liquids during each break to rehydrate what the sun has dehydrated through perspiration. Apply all sunscreens at least 30 minutes prior to exposure. Taking breaks of at least 20-30 minutes between sessions will encourage gradual color and better control because your skin temperature will have a chance to normalize. Tanning by going through a red or pink stage will shorten the life of your tan by as much as 50%. Remember also, that sun damage to your skin is cumulative - and causes premature aging of the skin as well as skin cancer. Tanning in itself is detrimental to the integrity of the skin - allowing your skin to become red or pink is ten times more damaging than tanning. Waterproof products contain oils and waxes which make them adhere to the skin, but those same oils and waxes will become your worst enemy if you use waterproof products when not in the water. Perspiration will build and be trapped under that layer of waterproofing which will serve as miniature magnifying glasses for the sun's intensity. Turning red, pink, or rashing will become a distinct possibility - regardless of the SPF number used. If you plan extensive water activities, use at least double the SPF number to compensate for that magnification factor, and then stay in the water to keep your skin cool to avoid burning and/or rashing. 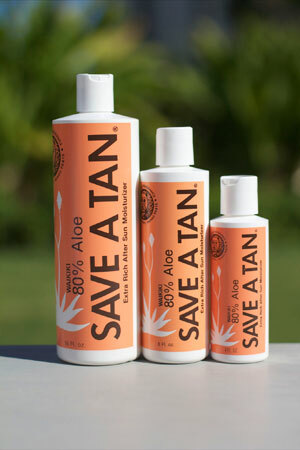 We recommend daily moisturizing with Save A Tan, Skin Moist with Vitamin E or Hand and Body Lotion with Vitamin E.